1. This is Dewees – An Introduction to Dewees Island, SC. 2. Dewees Transportation — getting to, from, and around Dewees. 3. Packing for a trip to Dewees. 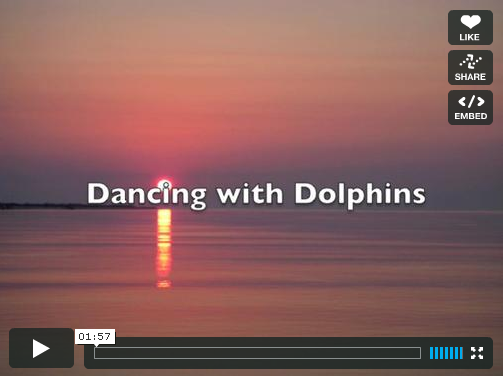 Summer on Dewees: Aerial Highlights from Yonder Blue Films on Vimeo. 5. A day on Dewees. A day on Dewees – Highlights from Yonder Blue Films from Yonder Blue Films on Vimeo. 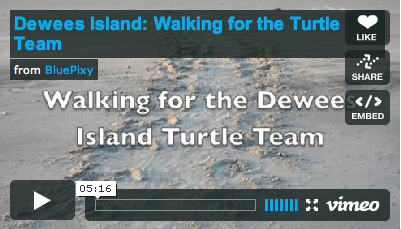 Dewees Island: Walking for the Turtle Team from Judy Drew Fairchild on Vimeo. Dewees Island Loggerhead Hatchlings from Judy Drew Fairchild on Vimeo. 10.Dewees Island: Garbage and Recycling from BluePixy. This is an educational video for Dewees Island, South Carolina. If we all work together, we can keep our island clean and free of trash. This video tells you about the various garbage systems: recycling, solar cones (composting) fishing line, fishing scraps, etc. 6. Alligators: Living with a top predator from BluePixy. This educational video explains the Dewees Island philosophy of living in harmony with nature as it pertains to one of our most visible predators: the American Alligator. Learn about crabbing and fishing guidelines which can help keep people and alligators safe. 7. Fishing on Dewees Island from BluePixy. Fishing on Dewees can be very rewarding. We serve as stewards of the island environment and practice our “tread lightly” philosophy, taking only what we need for the next meal and using “catch and release” techniques. 8. Here is a very brief video overview of what to look for when you are volunteering for the Dewees Turtle Team. Only those permitted by SCDNR can probe for and relocate nests, but everybody can volunteer to help look for tracks on the beach. This video shows you what the tracks look like and what else to look for on the beach, and gives you an idea of what field signs to take note of. Please contact Judy Fairchild if you would like to be a volunteer walker for our island Turtle Team. If you find turtle tracks that have note been crossed out, please call Gary McGraw, the head of the Dewees Turtle Team. 9. Crabbing on Dewees Island from BluePixy. This educational video has some crabbing basics and some guidelines specific to Dewees Island. Learn about alligator safety, crab dock etiquette, preferred bait, and South Carolina harvest limits. We take only enough for one meal so that we can continue to harvest crabs for years to come. Judy worked with ferry Deckhand Dillon Smith to create the following video. It shows dolphins frolicking in the Dewees Ferries’s bow and stern wakes. We love when the dolphin rolls on her side to look at us. Dancing with Dolphins from the Ferry from BluePixy. 11. Check out the new Nature Center at the Landings Building — that’s the first building you see when you arrive at the Ferry Dock. This video by Judy Drew Fairchild gives you a taste of the New Nature Center. The new Center officially opened on the Friday of Memorial Day Weekend 2009. A) In 2008, the Archives Committee of Dewees Island initiated an oral history project. The first informal conversation was filmed on the porch of Bobby and Janet Kennedy’s house. Jim Cochrane, author of Dewees Island’s history, interviewed two property owners who have longstanding personal and family connections to the island. The video has been edited and is approximately one hour in length. As it is a large internet file, the video takes a little time to load. You will see the menu bar appear after the load is finished. Yes, I was reading about tun shells when I came across the comment of one found on Dewees Island, as I have been reading about your island, I understand that it is only for residents who live there, so this is not an island to come visit and collect seashells while on vacation, correct? Dewees Island is ferry access only barrier island off the coast of Charleston, SC. It’s private, but you can rent houses. In fact, check out my beach vacation rental house website: DeweesRentals.com. The island is basically a nature preserve with 65+ houses on it. The island has a policy that says you should only take 3 shells per day of the beach. That way you focus on finding the very best shells. You also leave behind lots of good shells for other people to find, creatures to live in, and to break up and replenish the beach. There’s lots of great stuff to do. Come check it out.